What is Automatic Car Parking ? Automatic parking is an autonomous car maneuvering from a traffic lane into a parking place to perform parallel parking, perpendicular or angle parking. What’s the importance of this topic? Parking is one of the challenging thing for humans in Car Driving. Even though , lot of solutions available for smooth and safe driving such as car collision avoidance system, but very less focus is given to the the automatic parking system till recently. 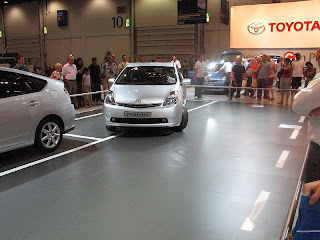 Although,many cars are now available with this feature such as Toyota Prius , still there is a long way to go. Mechanical, Electrical, Electronics and Computer Science , almost all branches. It is not an uncomplicated task to build up automatic parking expertise for a car. First of all, the car must be able to sense the surroundings, to find a free parking space and to detect obstacles in the car park. Secondly, it should have the capability to plan the movement itself from the input of sensitivity system. Lastly, it should be able to go after the premeditated motion sequences and to make sure that a goal position is reached, regardless of noise and errors. How Self Parking Works ?